We gladly present you with a unique market lease proposition of renting a universal system driving simulator, which will certainly be a perfect complement to your current offer of sale. Owing to our professional system, we can change any car into a real simulator, which enables a stress­free and accident­free test drive without the necessity to start the car. 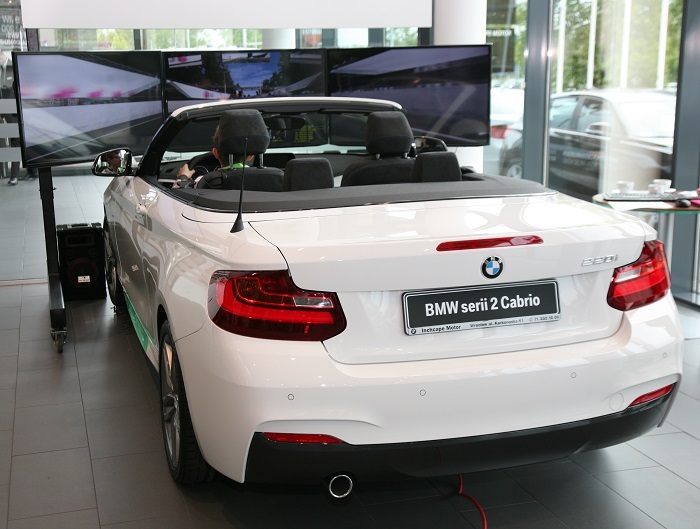 What is fascinating, every potential customer can test the car model on a virtual racing track. The exceptional ability to choose the car model and the scenery during the test drive meets the expectations of even the most demanding customer, additionally it allows you to closely integrate the simulator system with your offer. What is the most worth mentioning is the fact that the applied set does not interfere in any way with the system of the vehicle being tested. The driving simulator offered by us possesses the most advanced software available on the market, which provides an incredibly realistic car driving in any environment and concurrently unforgettable visual experience. The kit is portable and lightweight, allowing a quick setup even in a less accessible exhibition places. The offered driving simulator includes: wheel motion sensor, three 46″ Full HD TVs as well as independent acceleration and brake pedals. With its unique appearance the kit suits well in marketing campaigns, during open days in car showrooms, shopping centers or in private business meetings. Our product will stand your car saloon out among many others in the automotive market. We guarantee the delivery of equipment and full services for the duration of the promotion. If you are interested in our offer, please contact us immediately for details. We are looking forward to cooperating throughout Ireland.